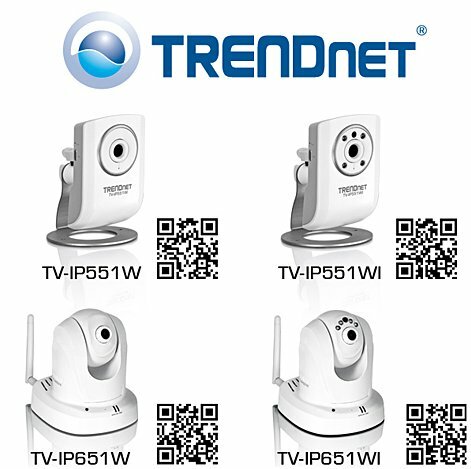 TRENDnet, a best-in-class wired and wireless networking hardware brand, today announces the availability of four new IP Cameras which offer upgraded image quality, a free mobile app to view video while on the go, and new industry leading free camera management software. "TRENDnet's new line of cameras set a new standard in the SOHO and SMB IP Camera space," stated Zak Wood, director of global marketing for TRENDnet. "Following this initial launch, eight additional megapixel cameras will be launched over the next six weeks." TV-IP551W features include: a high speed wireless n connection; one-way audio; 640 x 480 (VGA) video at up to 20 frames per second (fps); a free mobile app; free industry leading software to manage up to 32 cameras; and a wall / ceiling mounting kit. TV-IP551W Availability: Currently shipping to TRENDnet's online and retail partners. TV-IP551WI features include: night vision for distances of up to 7.5 meters (25 feet); a high speed wireless n connection; one-way audio; 640 x 480 (VGA) video at up to 20 frames per second (fps); a free mobile app; free industry leading software to manage up to 32 cameras; and a wall / ceiling mounting kit. TV-IP551WI Availability: Currently shipping to TRENDnet's online and retail partners. TV-IP651W features include: remote 340° Pan and 115° tilt functionality; a high speed wireless n connection; one-way audio; 640 x 480 (VGA) video at up to 20 frames per second (fps); a free mobile app; free industry leading software to manage up to 32 cameras; and a wall / ceiling mounting kit. TV-IP651W Availability: Will be available from online and retail partners in early June. TV-IP651WI camera features include: night vision for distances of up to 7.5 meters (25 feet); remote 340° Pan and 115° tilt functionality; a high speed wireless n connection; one-way audio; 640 x 480 (VGA) video at up to 20 frames per second (fps); free industry leading software to manage up to 32 cameras; and a wall / ceiling mounting kit. TV-IP651WI Availability: Currently shipping to TRENDnet's online and retail partners.